December 12, 2012 (London, UK) – A Priestess and an Incan Spirit guide players to opulent riches hidden amongst ancient temples in the latest new game at Slotastic Casino. 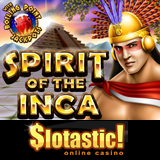 The new Spirit of the Inca is the first from RTG to have the new Boiling Point jackpot feature that shows players just how hot the game’s five networked jackpots are at any given time. The Priestess and the Incan Spirit are lusciously animated symbols. She is the Scatter and he is an expanding Wild that triggers up to 75 free games with prizes x 10. 15 bonus symbols will appear when the Incan Spirit appears on both reels 1 and 5. Players choose symbols to reveal their bonuses: up to 25 free games, x1 to x10 prize multipliers, a Wild Reel or an extra Wild on each reel for the free games. Spirit of the Inca introduces the exciting new Boiling Point Jackpots feature -- five networked progressive jackpots, each with a nail-biting 'Boiling Point' value on display showing players their respective 'Must-Trigger-By' values. There are five networked progressive jackpots: Grand, Maxi, Major, Minor and Mini. Slotastic welcomes players from around the world. Although it specializes in slots games there’s also a complete selection of table games like Blackjack, Baccarat, Craps and Roulette.